I'm trying to mark the end of "words" (including punctuation) with luatex callbacks. (At the end I want to inject space chars at this positions, but the example uses rules for the visualization). With some code based on \countwords from the chickenize package it works quite fine. I only have a problem with math: I would like to avoid to get marks there. Trying to do it with an attribute set in \everymath doesn't work as can be seen in the code below: It also affects other places like e.g. tabulars where math mode is used internally. 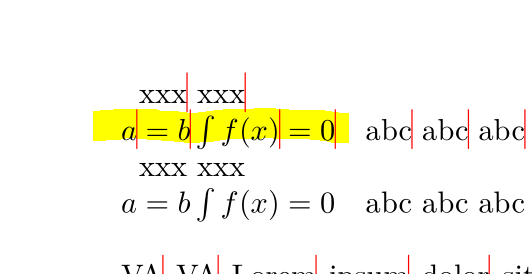 Has someone an idea how to exclude only "real" math from the mark function? Not the answer you're looking for? Browse other questions tagged math-mode luatex callback or ask your own question. Fitting display math with luatex?